Spain's prime minister has said the country will take in a rescue ship stranded in the Mediterranean, to help avoid a humanitarian disaster. Mr Sánchez, who took office a week ago, said the ship would dock in Valencia. 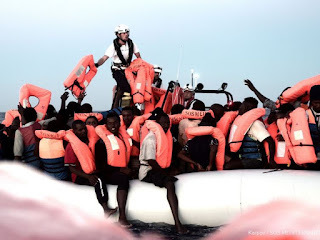 The migrants aboard the Aquarius were picked up from inflatable boats off the coast of Libya at the weekend, in six different rescue operations, according to the German charity SOS Méditerranée. "It is our duty to help avoid a humanitarian catastrophe and offer a safe port to these people, to comply with our human rights obligations," Mr Sanchez's office said. Malta's Prime Minister Joseph Muscat tweeted his gratitude to Spain, saying Italy had broken international rules and caused a standoff. He said Malta would be sending fresh supplies to the vessel, adding: "We will have to sit down and discuss how to prevent this from happening again. This is a European issue."